"A young scavenger accompanies the sole survivor of a transport carrier as she travels west in search of a way home." Hundreds of years after humanity was nearly wiped from existence, the world has finally come back from the brink. The lower and middle classes of society have erected towns and cities across the Northern Lands, while the upper class lives in seclusion on top of the last remnant of the old world: The Shell, an exoskeleton once meant to protect the earth. Carter is a young man, who travels from town to town as a scavenger and part-time trader. Orphaned as a boy, he goes without friends, family, or home. Instead, he puts all of himself into surviving, hoping that one day he won’t have to live day to day. Then, one day Carter’s life is changed forever. Amidst the wreckage of a Shell Transport Carrier, he finds Silvia, a girl from The Shell. Forming an unlikely friendship, the two set off to find a way to get Silvia home. But, as the two’s bond is forged through blood and fire, Carter must face an unsettling reality: can he ever return to the solitary life of a scavenger? 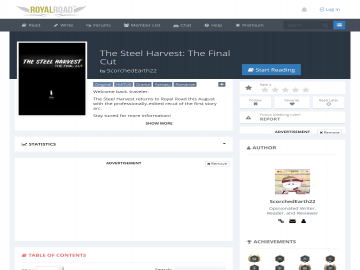 The Steel Harvest - Steel Beginnings (Volume 1) has not been tagged yet. Help others find The Steel Harvest - Steel Beginnings (Volume 1) by tagging it! The Steel Harvest - Steel Beginnings (Volume 1) has not been reviewed yet. The Steel Harvest - Steel Beginnings (Volume 1) has not been recommended yet.